This past weekend I was cleaning and sprucing up a dresser we bought from Craigslist for the nursery and I tried a natural "recipe" to refinish wood furniture. It made some difference on the dresser but its finish wasn't that bad to begin with. Then I decided to try it out on the buffet in our dining room and was super happy with the results! You may remember the buffet/sideboard from here that I bought at a vintage/antique place. So here is how to do this yourself. Mix together and use a rag to wipe a thin layer on furniture. After about 30 minutes follow up with a dry rag/cloth. Wait a few hours before putting items back on top of your furniture. Below you can clearly see that I have applied the mixture to the right side but not to the left side of the top. It made a huge impact on this wood furniture piece where the finish had definitely seen some wear and had lots of scratches etc. It really gave it new life! Since a thin layer of an oil mixture is good for wood, you can repeat this every year if you want to or anytime your wood finish pieces need some sprucing up. Note: I wiped the mixture on the entire piece, not just the top. Not gonna lie, I also did this to two of our end tables in the family room (that are both old hand-me-down pieces from my parents) and made them look years and years newer! It is best at refinishing scratches that aren't too deep. Now you can go to town refinishing all your wood furniture with 2 simple ingredients you have on hand. This is the perfect onesie for coffee loving parents! I made this using my Silhouette machine. First I saved the starbucks logo and imported it into the software and used the trace function to create the cutable image. I used photoshop to make the words in two separate file (I LOVE YOU and A LATTE) but you could also use paint or word or some other application if you don't have photoshop as long as you can save the words as a jpg. Then you can import the words into the Silhouette software too, trace it and arrange it around the starbucks logo. Then follow the Silhouette instructions for cutting your heat transfer vinyl, iron it to the onesie and it is ready to go for the parents-to-be! I gave this to Katie as part of her shower gift and cannot wait to see the baby rockin' it! 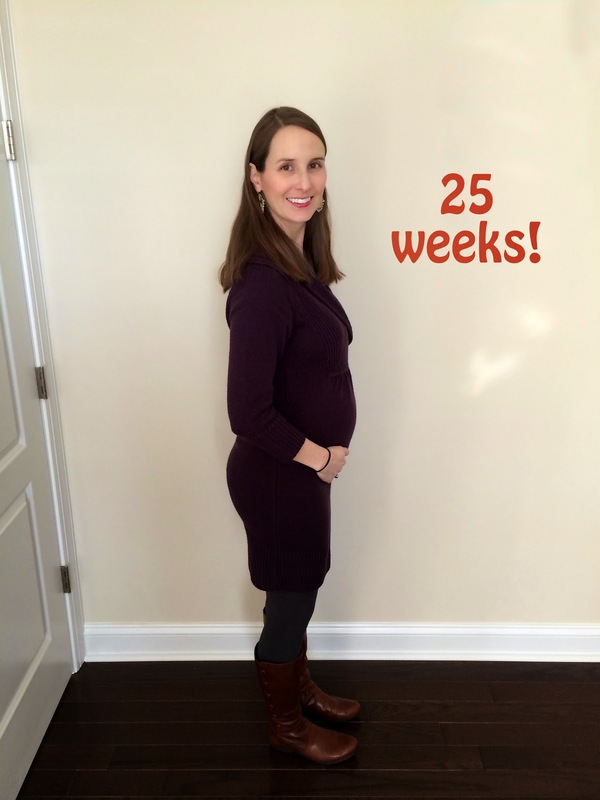 I thought I'd do another one of these updates since we reached 25 weeks earlier this week. Hard to believe we only have 15 weeks to go (if munchkin comes on his due date that is... which is something like 5% of babies haha)! This sweater dress with its awesome v-neck/sort of cowl neck is actually the first thing I ever bought from H&M. I got it when we took a trip to NYC to visit friends in 2009 and haven't ever found anything as great there since... maybe the H&Ms in NYC are better than ones in other cities. Maternity clothes: Yes, my maternity jeans and work pants are very comfy although this outfit just happens to be all non-maternity. Luckily my fleece-lined leggings still fit... those have definitely been necessary with the temps in the single digits and teens. Labor Signs: No, thank goodness... keep cooking Munchkin! Symptoms: A little lingering coughing from the cold I had a couple weeks ago, nose bleeding, and occasional back pain. Nursery: Paint samples are on the wall waiting for a decision but nothing else new. 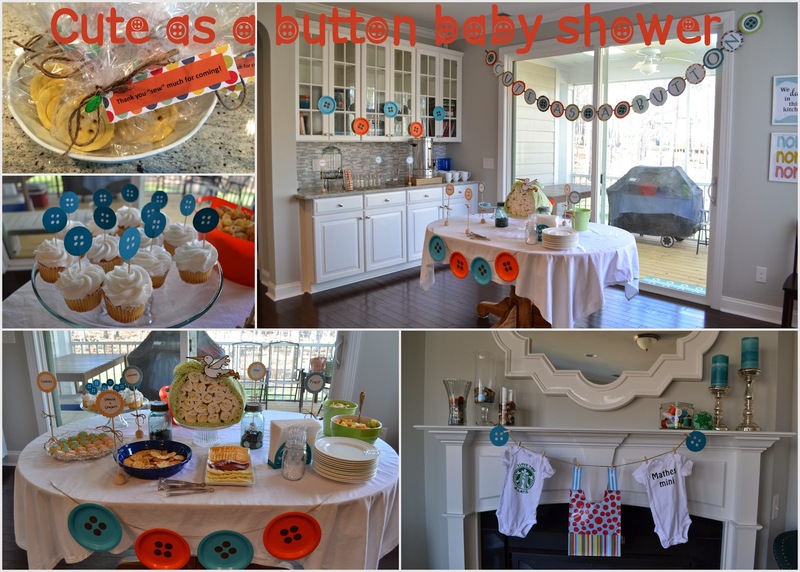 Last month I hosted a baby shower for one of my best friends along with her sister in law. The Cute As A Button baby shower was fun to plan and Melissa and I really enjoyed making it a special day for Katie and baby. First up is all the decor. I knew it would be good to do something sewing-related since Katie loves to craft and sew and when I was talking to a sweet neighbor about it she suggested the theme and even had the banner that I could borrow. The banner was already gender neutral with orange, blue/teal, lime green and brown which was perfect since the shower needed to be gender neutral. I loved the bright orange and blue/teal colors so I used those as the main colors. For the table centerpiece I did a diaper bundle on top of a cake stand. It makes for a nice centerpiece without being as involved as a diaper cake. I printed out the stork from an image found online onto white cardstock and had my mom serge around flannel for a blanket. You fold the blanket so it is almost as narrow as a rolled diaper and tie it up and fill it with rolled diapers. It had about 25 diapers in it. I also filled two vintage mason jars with assorted buttons. For the mantle I made two onesies with my Silhouette (one with the Starbucks logo that says I love you a latte and one with their last name). I put a wipeable/washable bib in the middle that had big dots on it that sort of look like buttons. I also cut out two buttons with the Silhouette to complete the hanging string. I filled vases with assorted buttons and a square glass container with thread and propped up my pin cushion for decor. This was the circle garland I made that I did a tutorial on here. When guests arrived everyone chatted for a bit and had food and drinks. Now for the menu.. we did an afternoon shower so a full meal wasn't necessary and we did lots of different snacks/appetizers and desserts. Melissa made most of the food and it was delicious! And I used some fun striped orange straws and mason jars for those having lemonade or water and then use coffee cups for the wassail. Once everyone was done eating we had games and activities. We played Baby Price is Right, Make a diaper out of toilet paper on a stuffed animal, and Baby Scategories. We also had people leave advice or wishes for the mom to be. I made the cards in Photoshop to go with the shower invite I made. These were the invites. I looked up various ideas and designed them myself in Photoshop and then had them printed on cardstock at staples. Then it was time for opening the gifts! Katie got a lot of really wonderful gifts from her registry and some handmade gifts too. And the Mathes family got her the crib and mattress... two very essential items! Katie is a Detroit Tigers fan and her husband is a St. Louis Cardinals fan so I made a parents divided onesie using my Silhouette. Can't wait to see the baby in this during baseball season. Melissa made these adorable button cookies as a party favor for the guests wrapped up with a note that says Thank you "sew" much for coming! All the sweet Mathes ladies... Katie's mother in law and sister in laws. Katie and I showing off our bumps. We are 10 weeks apart and I cannot wait for our babies to hang out and I know they will be great friends! I'm even more excited to find out if baby Mathes is a boy or a girl! 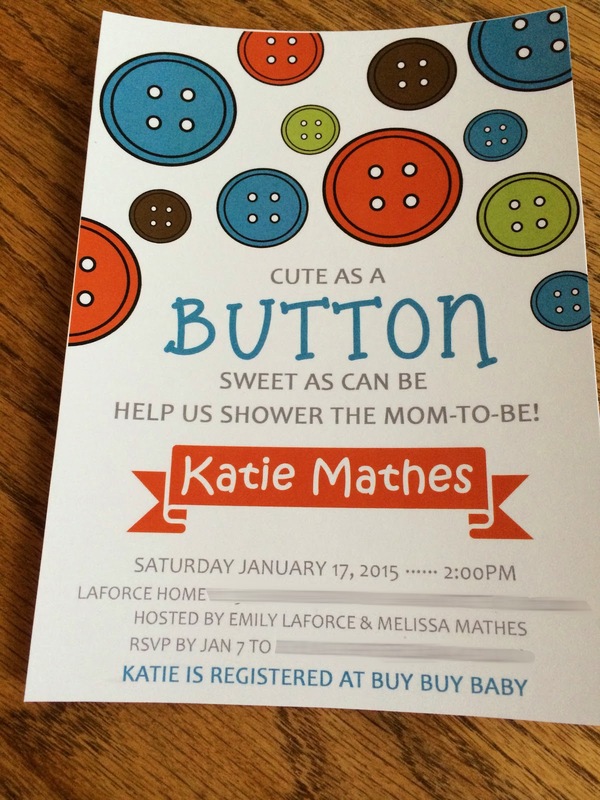 Hope this helps anyone out who is planning a cute as a button baby shower. A huge thanks to co-host, Melissa... I would plan another shower with you anytime! Sorry I have been MIA lately. Our house was plagued with an awful cold and fever last week and I'm just now starting to feel like a normal human being again. Thank goodness for my parents bringing over some food because we hardly left the house. This is a recipe I made a few weeks ago for a friend and neighbor that recently welcomed a little baby boy. I missed out on bringing them a meal soon after the birth due to the holidays so instead I coordinated it with her first week back at work. It's healthy but also comfort food so would be great during these cold winter months and would be a great meal to take to a new mom or someone who is sick. I paired it with some fresh bread from the bakery when I dropped it off. Preheat oven to 350 degrees and spray 2-qt casserole dish with cooking spray. Cook broccoli in microwave according to directions and set aside. Heat olive oil over medium high heat. Add onion and mushrooms and cook until tender. Add chicken and cook until cooked through. Sprinkle in flour and stir constantly for 1 minute. Stir in milk, bring to boil and cook for 3 minutes. Stir in cooked broccoli and heat through about 1 minute. Add mayo, yogurt, salt and pepper and stir until combined. Pour into casserole dish and top with cheese. Bake for 20 minutes.